1.Take a cookie sheet and cover it with foil, pre heat oven to 350-375°F. 2.Get your hands dirty! In a large mixing bowl add ground beef, Worcestershire sauce, garlic powder, salt and pepper to taste. Mix well with your hands. Make patties according to the size you want. Place patties on foiled cookie sheet. 3.Bake until done to your preference (for well done-30 minutes or so). 4.When patties are done, make gravy according to package instructions. 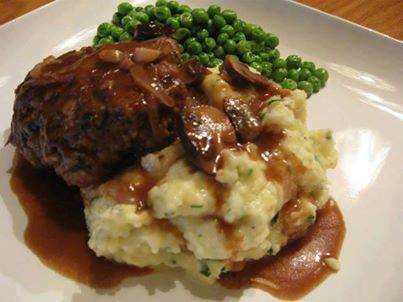 Pour brown gravy on top and enjoy with some mashed potatoes!